Have you ever woke up with a “stank” attitude for no apparent reason? A few days ago I experienced this for no reason at all. Everyone that called seemed to irritate me. In conversation with the Holy Spirit, and as conviction set in, I remembered that at all times I have to be an imitator of Christ. For some apparent reason I started thinking of the Seven Dwarfs. Mainly because of the one I was currently resisting, Grumpy, but also, just as in the movie “Snow White and the Seven Dwarfs”, these little “attitudes” can creep up at any time and alter your entire day. “Doc” was the leader. His character was that of someone very pompous or self-important. The Bible tells us, “For everyone who exalts himself will be humbled, and he who humbles himself will be exalted.” Luke 14: 11 ESV Sometimes we have to check our humility gage! “Grumpy”. Being grumpy is like being a complainer. You’re tired of your job, but you can pay your bills! You can’t find a man, and yet every gentleman that approaches you, you act “stank”. My husband gets on my nerves, Suzy will be glad to have him! “The tongue has the power of life and death, and those who love it will eat its fruit.” Proverbs 18:21 NIV. Speak power and life. Speaking death is being a mouthpiece for the devil! “Bashful”. This attitude can creep in and get the best of us. How many times have you been silent instead of standing up for God? How many times have you found yourself unequally yoked with your friends and refuse, out of shyness, to stand boldly for the Lord? Jesus warns us, “But whosoever shall deny me before men, him will I also deny before my Father which is in heaven” Matthew 10:33 AKJV. “Sleepy”. How many times have you let the enemy of procrastination into your camp? You walk around sleepily dragging your feet. Some of you have dreams to embark upon, yet you allow a “sleepy” like attitude to interfere. “How long will you lie there, you sluggard? When will you get up from your sleep? A little sleep, a little slumber, a little folding of the hands to rest— and poverty will come on you like a thief and scarcity like an armed man.” Proverbs 6:9-11 ESV. Get up, you have work to do! “Happy”. A Happy attitude is pleasant. Kirk Franklin says it best, to be happy, something has to happening! I encourage you to learn to replace your happiness with joy. Joy is a confidence birthed through faith in Christ. Joy is a feeling of assurance you can feel even when you are down and out. Happy is great, but Joy is everlasting. David prays, “You have made known to me the path of life; you will fill me with joy in your presence, with eternal pleasures at your right hand.” Psalms 16:11 KJV. God can grant you unshakable joy! “Dopey”. Dopey was the youngest dwarf. Socially he was immature and seemed to be a “dud.” It is so easy to fall into the “Dopey” category of putting back on our childlike attitudes and behaviors. Paul tells us in the Bible, “When I was a child, I talked like a child, I thought like a child, I reasoned like a child. When I became a man, I put the ways of childhood behind me.” I Corinthians 13:11 NIV. Don’t let your childish ways of bickering, anger, and pettiness creep in. You are a woman now, put away child-like things. I know this was a far-fetched, yet creative, attempt to say one thing: watch for those insecurities and bad attitudes that can creep in on you. Put on the full armor of God so that you can withstand the enemy. I plead guilty for having a bad attitude when I know I shouldn’t. The fact that You took a perfect soul to stand in the gap for my sins, should remove any stench of a bad attitude. Please forgive me if I seem ungrateful. Please help me along this Christian journey as I learn to be an imitator of You. In Jesus’ Name, Amen! Ladies, I EMPOWER you today to rebuke those dwarfs! Put on the full armor of God every morning before your feet hit the floor to guide your attitude throughout the day. Secure it again at night to ensure your mind is fixed on God as you go to bed. God has been too good for us to have a bad attitude! Great empowering message. Grumpy and I have been into it for a few days now. Hoping to have him conquered before I take the kids (daughter and her friend, niece and her friend, and nephew) out on an outing tonight. Glad to see I am not alone, but we have to realize Beverly (both of us) that we wrestle not against flesh and blood but the schemes of the devil. I pray you all have a great time tonight, we are conquerors!! I am encouraged by God’s Words. Thank you Lord for encouragement! I beg to differ; this really was on time, not far-fetched at all but very creative. I would never have thought to even think about the seven dwarfs in any spiritual way. This piece has truly blessed me and whenever I feel “grumpy” or “sleepy,” I will refer back to the message God has given you to share with the sisters today. Thank you again and be blessed. Thank you for your encouragement, it means alot. I have to keep in mind of the Grump dwarf too. God has been too good to let senselessness still my joy!!! Thank you for reading Geri! ok so i did find myself. sleepy and bashful. at one time in my life my friends were everything to me and whether i agreed with what they said or did i tolerated alot of things. however as i grew in christ and he became my model for simply everything! it has become easy to remove myself from relationships that spoke death to me in many ways. he erased what i thought would be my lot, lonliness, friendlessness, (is that a word), and popularity. now it is easy for me to put these relationships in the right place in my life. thanks for reminding how blessed i am in him. Kay this word was awesome! I’m so convicted because I have a bad case of the “sleepy.” I’m going to the doctor today to see if I need stronger vitamins or what but I know procrastination is holding me from some of the blessings God has for me. Thank you for this word today! Procrastination can be such a bother at times! Trust me I know. It’s not listed in the Bible as sin, but we are charged to do things as unto the Lord, this bites me every time. I pray for your healing and clarity with what you need. God bless you! Thank you so much….this school year me and sleepy have become real close thank you for letting God speak through you to convict me! This was soooo creative …the seven dwarfs: spiritual side …I LOVE IT!! I would have never guessed this would touch so many people. I am glad you enjoyed reading this and I pray you were encouraged through Christ. Kay, this is soooo good! I love the way you used the Seven Dwarfs! 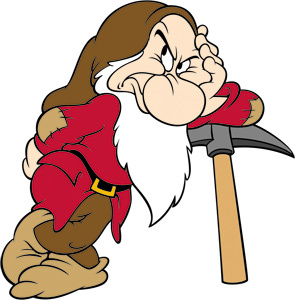 I am so guilty of allowing all seven of the dwarfs but especially Sleepy, Bashful and Grumpy. This is being sent to the printer as we speak. I need this before me! Thanks for a great word in a creative package! I appreciate you appreciating my creativity, lol. When God gave me this I immediately thought is was lame, but to God be the glory. He blessed me through His words. I’m printing it too!